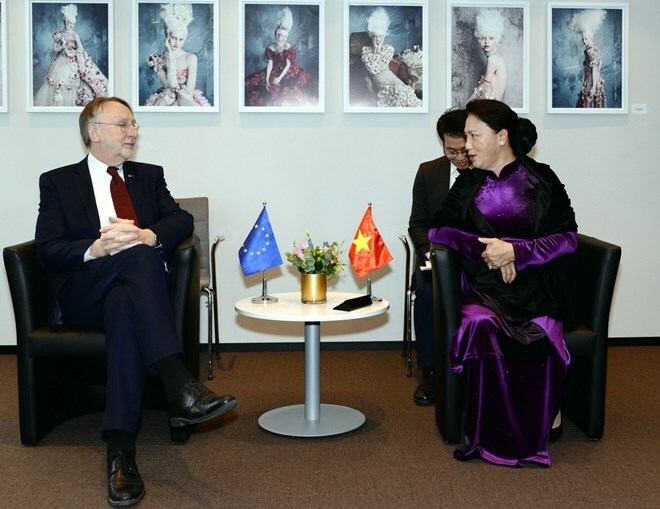 Brussels (VNA) – National Assembly Chairwoman Nguyen Thi Kim Ngan met with Chairman of the European Parliament (EP)’s Committee on International Trade (INTA) Bernd Lange in Brussels, Belgium on April 3 (local time) as part of her working visit to the EP. The Vietnamese top legislator said she has looked forward to the meeting as a chance to discuss the EU-Vietnam Free Trade Agreement (EVFTA) with the INTA – an important agency of the EP. Vietnam is focusing on realising commitments it made in the deal with good will and specific actions, she said, adding that the Vietnamese NA is working to turn those commitments into laws. Ngan said the Vietnamese NA has asked local agencies to address the recommendations that the EP had made during past working trips to Vietnam by the INTA Chairman and EP Vice President Heidi Hautala. The leader expressed her hope that the INTA will support the prioritization of issues regarding the EVFTA and the Investment Protection Agreement (IPA) between Vietnam and the EU in the EP’s agenda at the beginning of the new tenure. Bernd Lange told his guest that he had made every effort to accelerate the signing and ratification of the EVFTA, and explained that the process had been delayed as the EU has to deal with some issues, including Brexit. The agreement might be signed and approved in June or July, after the EP completes its elections and begins a new term, he said. Talking about labour-related issues, NA Chairwoman Ngan said there are differences in the views of Vietnam and the EU on some labour issues, but Vietnam will carefully consider the recommendations made by the EU and the EP. She stressed that Vietnam’s Labour Code has been built in the spirit of protecting interests of labourers, adding that the revision of the code has been started and the NA is scheduled to give opinions on the revision at its May meeting. Bernd Lange said the cooperation between the EU and Vietnam is on the right track, and a dialogue mechanism is necessary for Vietnam and the EU to deal with issues of difference.